USP’s “Best Christmas Pageant Ever” Shines! Director Tom Vander Well had announced to the cast after the closing performance that the final show attendance was 331, but a review of the numbers revealed an error in the figures. 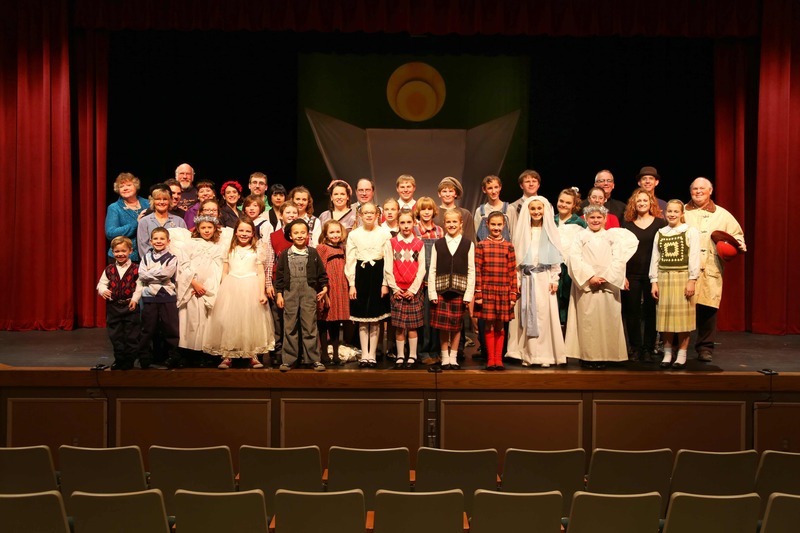 Nevertheless, this production of The Best Christmas Pageant Ever proved to be the best attended non-musical show in USP recorded history and the first non-musical to exceed 1,000 audience members. The total of the four show run was 1081 audience members is almost twice the average non-musical audience (526), and while holiday non-musical shows tend to attract a larger average audience (731) this year’s Best Christmas Pageant Ever set new records. Congratulations to cast and crew who put together another successful USP production! When Thomas Prins was 18 his hometown of Hebron, Iowa (population 318) was boiling in a scandal that was never resolved. He packed his bags and left for college in New York City. He went to school, found unexpected success as a writer, and never looked back. Twelve years later, after his parents lose their lives in a tragic auto accident, Thomas has no choice but to return home. The town prepares for the funeral and the local residents are atwitter that “Tommy” is coming home. With his return, heat is turned up on the old scandal which has quietly simmered in the town’s collective conscience since his departure. Ham Buns and Potato Salad is a play about going home. It’s about grief and hope. It’s about confronting our past and stepping into our future. It’s about small town quirks and human frailties. It’s about fear and love and grace and forgiveness. The Cast is Rioting! Get Your Tickets TODAY! Thu Dec 5 at 7:00 p.m.
Fri Dec 6 at 7:00 p.m. Sat Dec 7 at 7:00 p.m.
Sun Dec 8 at 2:00 p.m. matinee! All performances are on the stage of the Joan Kuyper Farver Auditorium in the Pella Community Center, 712 Union Street, Pella, Iowa. 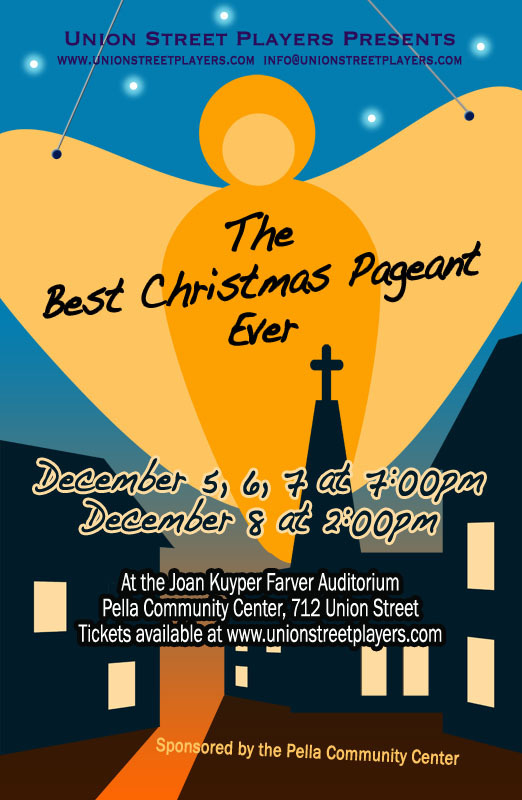 Director Tom Vander Well has announced the cast list for Union Street Players’ holiday production of “The Best Christmas Pageant Ever.” The show will be performed December 5-8, 2013. Union Street Players is excited to reprise what has become one of the most beloved Christmas tales. USP President, Tom Vander Well (previously directed The Odd Couple (Female Version), Morning’s at Seven, Barefoot in the Park), takes the helm of this holiday production which will be produced for the fourth time by USP. In this hilarious Christmas classic, a couple struggling to put on a church Christmas pageant is faced with casting the Herdman kids–probably the most inventively awful kids in history. You won’t believe the mayhem – and the fun – when the Herdmans collide with the Christmas story head on! This delightful comedy is adapted from the best-selling Young Adult book, and has become a holiday staple for theatre across the United States! Features plenty of great roles for children and adults, a few favorite Christmas Carols, and a lot of laughs!